With the creation of a single global market in financial services, the effective regulation of banks at the international level has become essential. 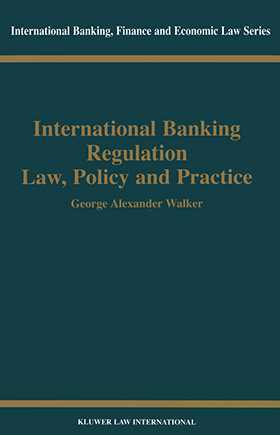 This work offers a comprehensive examination of the development and structure of the current provisions for the control of international financial markets. It explores the background to the recent major financial crises and the nature of the global response, beginning with the collapse of the Bretton Woods system of managed exchange rates and the resulting establishment of the Basel Committee on Banking Supervision in 1974. The author describes the structure and operation of the Committee and examines both the content of its core supervisory papers and the development of its more general regulatory programme. The emergence of increasingly complex international banking and financial conglomerates has required a fundamental revision of the traditional sector-based methods of supervision and regulation. The book examines the difficulties associated with the cross-border and cross-sector regulation of such groups and assesses the international response to these problems to date. The most recent financial crises in Asia and elsewhere during the late 1990s have generated further anxiety concerning the stability of the international financial market place. The causes of the crises are accordingly examined and the various responses adopted as part of a new international financial architecture analysed in detail.